This exhibition consists of ten of PNCA’s Visual Studies candidates, each exploring interdisciplinary methods in their studio practices. These artists include: Frances Elyse Hanson, Simone Fischer, Matt Perez, Isabel Salas, Shih-Ying Hu, Payton Barronian, Kristin Derryberry, Sarah M. Peters, Krista Cibis, and KT Dimmick. The exhibition consists of ten works, ranging from photography, sculpture, painting, video art, and large-scale installations. 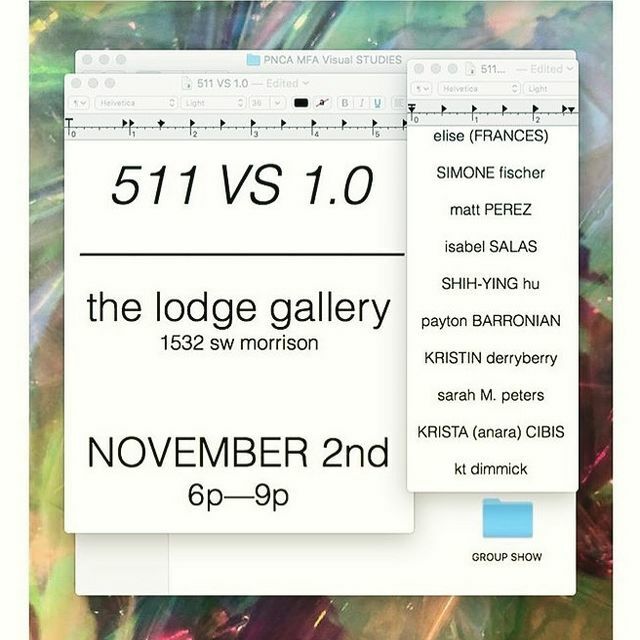 511 VS 1.0 will be on view at the Lodge Gallery from November 2nd to November 10th, 2018. Gallery hours are available through the gallery’s discretion and by appointment. The artists will be present and will be giving public presentations on their work, if time permits on Friday, November 2nd at 6:00 p.m. at the Lodge Gallery.